Apart from this, what grabbed our eyeballs is the loving gaze she had, as Trump began his joint session speech in Washington D.C.
WASHINGTON: U.S First Lady Melania Trump knows how to make a grand entry! Dazzling in a black overcoat, Melania turned heads, as she made her way into the House Chamber to support her hubby U.S. President Donald Trump’s speech at a joint session of Congress. According to CNN, the 46-year-old First Lady donned 9,600-dollar sparkly black Michael Kors outfit, with a deep V-neck line and thick buckle, showcasing her petite frame. CNN further reports that Melania is not the only First Lady to don Michael Kors on a night like this. 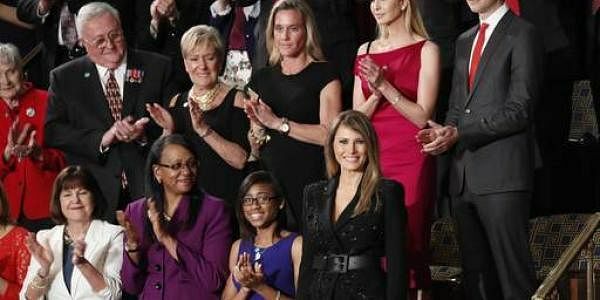 Michelle Obama too wore a 2,500-dollar Kors suit to Barack Obama's State of the Union in 2015. President’s eldest daughter, Ivanka Trump was seen wearing a magenta asymmetrical dress, which was branded “inappropriate” and “awkward” by social media, as according to them, it was more fitting for cocktails, than Congress. According to News.com.au, Ivanka’s dress, instead of her much-criticised self-titled clothing line, was by French designer Roland Mouret that cost nearly 4000 dollars. Another thing that could not go unnoticed was the blue tie, instead of the red that is traditionally associated with the Republican Party, donned by the U.S. President, Vice President Mike Pence and Speaker of the House Paul Ryan.